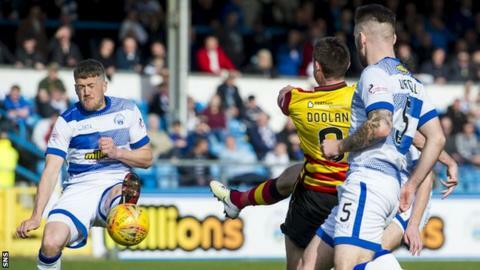 Kris Doolan scored twice as Partick Thistle won convincingly at Greenock Morton to move out of the Scottish Championship relegation zone. The striker trundled in the opener and turned Scott McDonald's cross after Steven Anderson had scrambled Thistle second - all before the break. Blair Spittal had a goal disallowed but Thistle move above Falkirk into eighth. They are now just two points behind Morton, who have a game in hand away to Ayr United on Tuesday. Morton manager Jonatan Johansson: "We should've scored first but the manner we lost the first goal is really poor. It doesn't help when you lose two centre-halves to injury in Kilday and Kerr Waddell. "With the teams at the bottom winning, it's getting to the time when you have to stand up and be counted." Partick Thistle manager Gary Caldwell: "Right from the first minute I thought we had a good intent about us. "Doolan and McDonald were excellent all day. They showed their experience and their class and were the difference. Kris Doolan is a legend for this club and today he looked like his old self." Match ends, Morton 0, Partick Thistle 3. Second Half ends, Morton 0, Partick Thistle 3. Substitution, Partick Thistle. Lewis Mansell replaces Kris Doolan. Substitution, Partick Thistle. Aidan Fitzpatrick replaces Blair Spittal. Attempt saved. Andrew Dallas (Morton) left footed shot from the right side of the box is saved in the bottom right corner. Attempt missed. Scott McDonald (Partick Thistle) right footed shot from outside the box is close, but misses to the left. Substitution, Morton. Dylan Dykes replaces Charlie Telfer. Substitution, Partick Thistle. Craig Slater replaces Stuart Bannigan. Attempt missed. Charlie Telfer (Morton) right footed shot from outside the box is close, but misses the top right corner. Corner, Partick Thistle. Conceded by Robby McCrorie. Attempt saved. Scott McDonald (Partick Thistle) right footed shot from outside the box is saved in the top centre of the goal. Attempt missed. Chris Millar (Morton) right footed shot from outside the box misses to the left. Chris Millar (Morton) is shown the yellow card for a bad foul. Stuart Bannigan (Partick Thistle) wins a free kick in the defensive half. Attempt missed. Steven Anderson (Partick Thistle) header from the centre of the box is close, but misses to the right following a corner. Corner, Partick Thistle. Conceded by Jim McAlister. Substitution, Morton. Andrew Dallas replaces Reece Lyon. Attempt blocked. Steven Saunders (Partick Thistle) left footed shot from the centre of the box is blocked. Corner, Partick Thistle. Conceded by Gregor Buchanan. Attempt blocked. Kris Doolan (Partick Thistle) left footed shot from outside the box is blocked. Corner, Morton. Conceded by Steven Saunders. Attempt missed. Reghan Tumilty (Morton) left footed shot from outside the box is high and wide to the left. Corner, Morton. Conceded by Shea Gordon. Jack Iredale (Morton) wins a free kick on the left wing. Attempt blocked. Reece Lyon (Morton) right footed shot from outside the box is blocked. Substitution, Morton. Keelan O'Connell replaces Kerr Waddell.